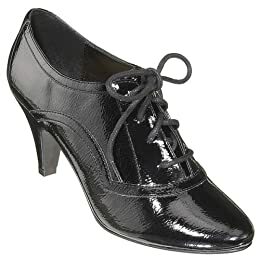 I never gotten into oxford heels/granny shoes, I really liked how they look but it never occurred to me to buy a pair. Well, I was doing a fashion shoot the other day and when I saw the heeled Dolce & Gabbana oxfords an other model was wearing I fell in love. After searching high and low I found a couple that I liked at a good price. the retrocuties ones and the target ones are my favourites...i love these shoes, i wear them with a vintage kneelenght skirt and i feel a with a little, don't know why. the first ones are my fav. but i had a diesel version of this type of shoes and they r my fav. to bad its an old collection(i mean from diesel). love the first and third pair ! I have the urban outfitters shoes (brand is called 'made by elves') and I love them!